Over 30 years ago, I walked into my first datacom room. It provided the network and data interface for a food processing facility. It connected all the plant's office computers, along with providing connectivity to the home office across town. It was housed... in a closet. And not a big closet, either. Over the years, the plant's infrastructure needs grew. While it started out with just a single rack in the closet, it morphed into a much larger "glass house," housing the plant's internal servers. 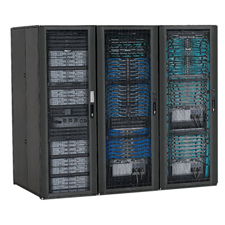 There was still a rack on the wall — actually several of them — to hold the additional switches needed to rack up the connections to the ever-growing population of office PCs, work stations, and thin clients. It wasn't long before supplementary mini-data centers sprung up throughout the facility. As the IT needs grew, more space was allocated in other office spaces. Now understand... the original plant was built in the 50's. Other than phone, fax, and snail mail, data storage and exchange wasn't all that complicated. In fact, a room full of file cabinets filled the need. To data centers... and beyond! That facility still isn't as efficient as it should be. But, the parent company made leaps and bounds in data storage and management. It had to as it acquired smaller companies and merged with larger ones. In fact, they built a huge underground data center, lovingly called "The Bunker." It wasn't full of equipment at first. But as other companies were brought in under it's "umbrella," the center's infrastructure grew with it. I've heard that it's eventually taking its data management to the cloud. While we sometimes look into space and think of cloud storage and management as some ethereal thing... it's not. Just another huge data center, with tons of equipment. The equipment in the local facilities may be pared down a bit as it connects to the cloud. But cloud data centers, an industry that's growing at amazing speed, will still need to be agile and upgradeable, both in equipment and software solutions. In the next article, we'll look at some of the intricacies of managing data centers. The products and equipment required are common to local centers and remote storage, even though the scale differs.